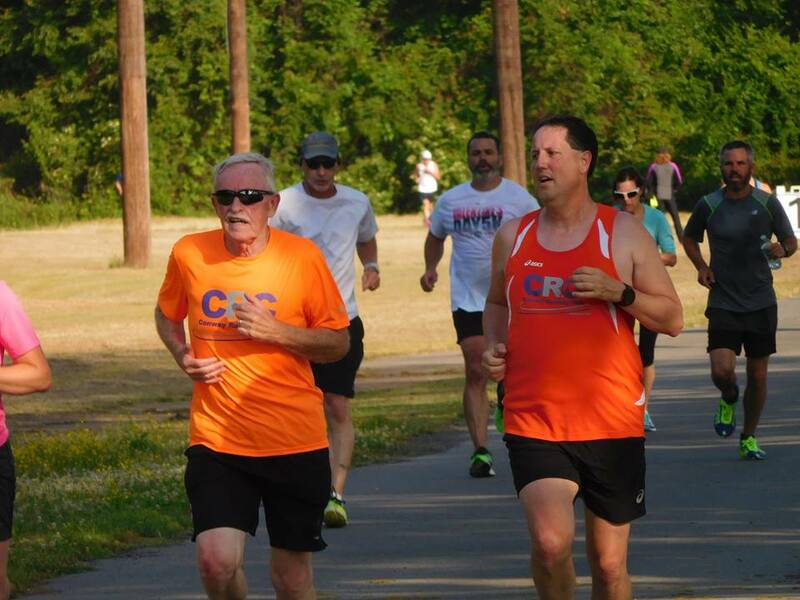 The Rock Run 8K held on May 14 was eventful in many ways; from the way it started prior to the race and definitely with the race itself. As I've written before, I'm getting ready to deploy and my running opportunities with Braden have become fewer and fewer. I have been blessed that my unit has allowed me to come into work a little later as I run my final races with Braden. 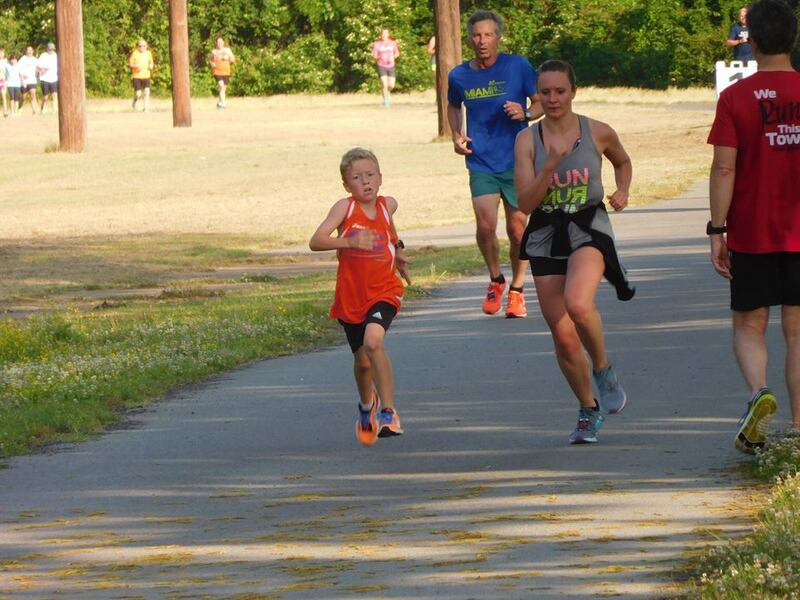 Even though he is outpacing me greatly these days, it still means a great deal to me to be a part of his running. Since I knew this was going to be the last race I had with Braden before deploying, I asked (with the help of David Meroney) the race director, Breda Turner, if Braden and I could lead the Pledge of Allegiance after the singing of the National Anthem and she graciously said yes. After leading the Pledge, we got settled into our starting position. It’s always been a fear of mine of something happening at the start because there’s been times where we’ve had other runners take a tumble in front of us due to congestion. Well, for the first time, something did happen, and of course it happened to Braden. As he was trying to navigate through traffic he shifted in front of another runner and she accidentally stepped on his heel and off came his shoe. What’s worse than losing your shoe? Having to go back against the flow of traffic...in the middle of the road...with runners bearing down on you! Thankfully two of our CRC teammates assisted Braden; Julie Kaylor sacrificed herself to protect Braden as he tried to get his shoe back on and Cathy Potter turned into a hurdler as she cleared Braden to keep from running over him! Remarkably, it didn’t take him long to get going and start pushing himself towards the front again. The only thing I was concerned about was that he expended a lot of energy trying to gain back the time he lost. 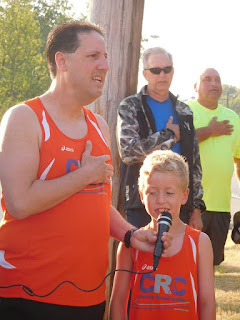 He finished his first mile at a quick 7:28 pace…despite the issue at the start! When we got into mile two, things started to look a lot like the Capital City Class 10K when he started having issues in the middle part of the race. The way things are now, it’s always a bad sign when I start catching up to him after he’s opened up a sizable lead on me and towards the end of the second mile I had pretty much caught him as he finished mile two at an 8:59 pace. As I came up to him during mile 3, I noticed he had inexplicably obtained a nose bleed! Unfortunately, I think it freaked him out and he started to panic, even though it wasn’t bleeding profusely. On top of the nosebleed, he was complaining about his leg as well. It got to the point where I was ahead of him and was slowing up so I could make sure he was okay. His third mile ended at a progressively worse 9:15 minute per mile pace. After hitting the turnaround point during mile four, Braden was still struggling a little bit, but he started to pick up the pace again. At that point, the wind was to our back and I encouraged him to try to go for it once we had a 1.5 miles left. He kicked it into gear and started opening up a lead on me again. His fourth mile pace ended up being 8:50 per mile. I don’t know how he does it, but he just knows when to push hard to the finish and as I watched from a distance, I was glad to see him fight through all the things that went against him during the race. As for me, I was ahead of Papa Bernie and decided to stop to let him catch up to me so we could finish together. Braden saved his fastest split for the last mile, finishing at a 7:27 pace. 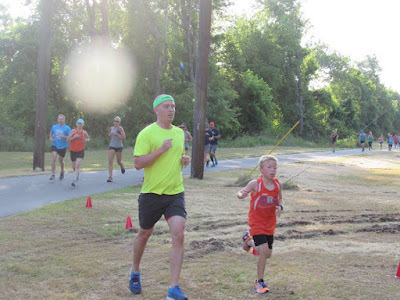 Overall, he crossed the line at 41:40 (an 8:23 pace), which was good enough for first place in his age group and a new PR, but it was about 3 minutes slower than what he had anticipated. In actuality, it turned out to be his worst race (based on age-percentage) this calendar year, but I had to admire his perseverance throughout all the stuff that happened…he doesn’t know the meaning of quit! Since the Rock Run 8K was a non-championship Grand Prix event, Braden picked up 20 points and now has a total of 180 points and is still sitting in 1st place in the standings. Once again, this was a tough race because it was our last one together for a long time. While he remains behind to win more medals and trophies, I’m going to put my focus into losing weight and getting faster in my off-time during my deployment. It’s definitely painful leaving my running buddy behind, but I will be tracking his progress and writing blogs every single step of the way! 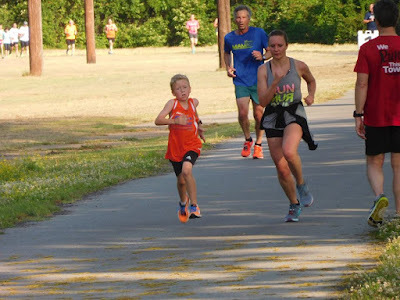 Braden’s next road race will be the Arkansas Runner 2 Miler, and along with the road races, he’ll be running more track and field events in preparation for the USATF Junior Olympics in July/August.